What is included in the Destination Fee? Manager’s reception in the tavern on the second floor Monday to Saturday 5:00 p.m. to 6:30 p.m.
Free coffee in our lobby from 6:00 a.m. to 10:00 a.m. and fruit infused water from 10:00 a.m. to 5:00 p.m. Sorry, pets are not allowed at the hotel. The hotel provides valet parking at $32 per day. The spaces in front of the hotel are for loading and unloading only. Parking at city meters in Savannah is also free of charge from 8 PM to 8 AM Monday through Saturday and all day Sunday. 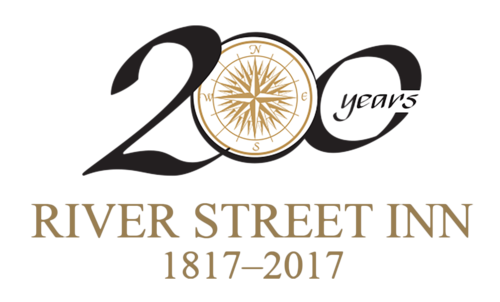 What is the best way to get to River Street Inn? The hotel is not accessible by River Street. All cars must enter from East Bay Street. For more detailed instructions, visit our directions page. How many people can the River Street Inn accommodate in a single party? River Street Inn can accommodate anywhere from ten to 40 people. Will Trolley or Riverboat information be available at the concierge? Trolley and Riverboat tickets can both be arranged with our front desk staff and the Trolley tours pick up directly in front of the hotel. The Riverboat is just a short two-block stroll along the river.